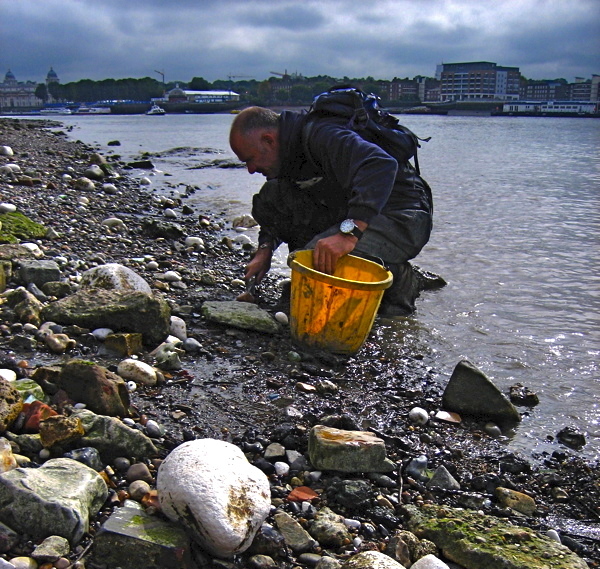 In London, the Thames has always been the natural receptacle for concealing and disposing things, creating a miry hoard of secrets, all just waiting for Steve Brooker, the mudlark, to come along and snaffle them up. 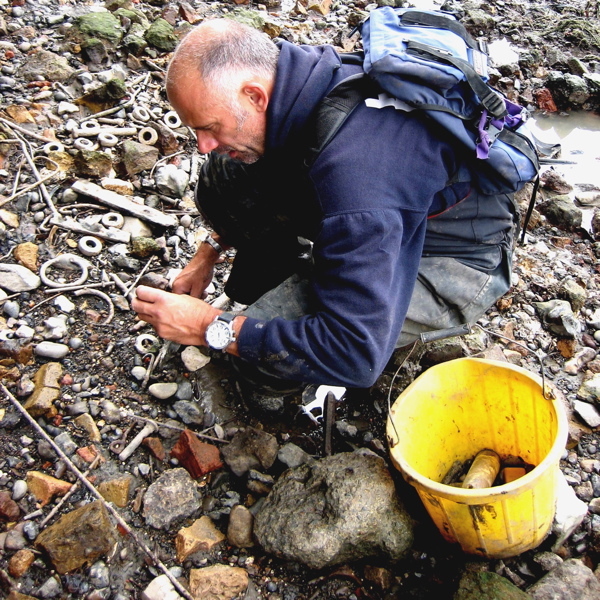 Over the last seventeen years while he has been searching, the mud has been eroded by wash from the Thames Clippers, exposing an unprecedented level of finds that compel Steve to come mudlarking several times each week at low tide and be the first to see what has been newly revealed. Steve is widely known as the Mud God – which seemed a little far fetched to me – until I saw him striding towards me eagerly in his chest-high bespattered waders, clutching his yellow plastic bucket and trowel. Over six feet tall with a grizzled beard and intense, glittering eyes, he was as excited to get down onto the beach as a child on the first day of the Summer holiday. Only someone with Steve’s natural authority can carry off such unmediated enthusiasm naturally. He is a man who is confident of his place in the world, and that place is the foreshore of the Thames. We came down the slipway as the tide fell towards its lowest ebb. The day was mild yet occluded, and my heart lifted as I was released from city streets into a vast open space, the domain of water and sky. The territory of the Mud God. He understands the idiosyncrasies of the tide, and the nuances of the mud banks and the river bed. 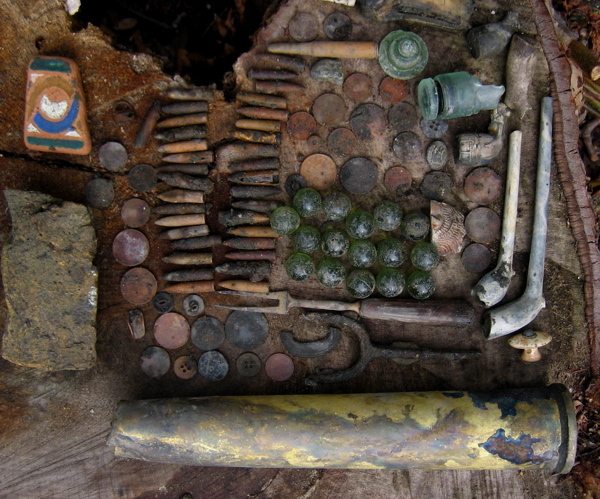 As well as coins and buttons, he finds Roman shoes, Medieval pins, eighteenth century witches’ bottles, nineteenth century lovers’ tokens, twentieth century voodoo dolls, live bombs and new guns – and sometimes he find human bodies too. He knows where to look and he does not need a metal detector because he has sharp eyes. When Helen Mirren lost her ring throwing her grass clippings over the river wall from her Wapping garden, it was Steve who found it for her in the river. When villains throw handguns and sawn-off shot guns into the river at Woolwich to lose them forever, it is Steve who collects them and hands them to the police – he found fifteen recently. Mudlarks tend to work in pairs for safety’s sake on this hazardous river and I had the privilege to be Steve’s partner in slime for a day. And I was happy to be in his company because Steve is a member of the Society of Thames Mudlarks, has a licence from the Port of London Authority and has the necessary experience to judge the treacherous movement of the tide against the access points to the shore. On the beach, Steve used his trowel to indicate where the mud had been washed away revealing a fresh bed of stones beneath, suggesting the type of location worthy of searching. Scraping away the top layer, he scanned for objects and passed me a Medieval pin – a sign that other personal or domestic artifacts might be present. Thus the pattern was established of walking, scanning and pausing to scrape at promising sites. We continued until Silvertown where thousands of bullets mysteriously litter the foreshore, an unexplained military dump from World War II. All around the Isle of Dogs, we walked upon a shore littered with the metalwork of the ship building industry that was once here. Lying redundant, we saw eighteenth century iron splitters used for breaking up tree trunks into planks, to build ships sunk long ago. At low tide, we reached Mast Point where Steve finds whole clay pipes. 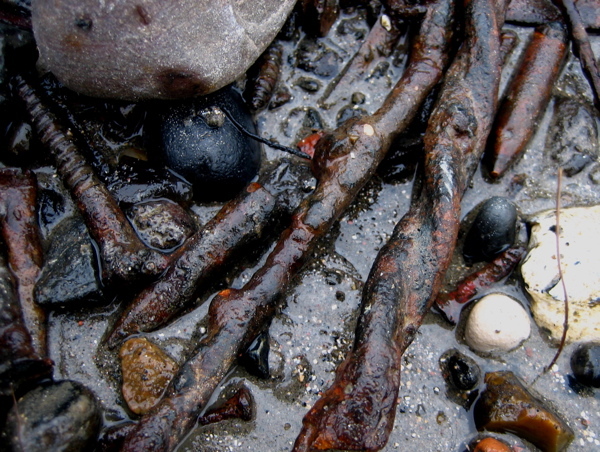 Pipes that once fell from a stevedore’s hand and sunk into the mud without breaking. Here I saw impacted layers of eighteenth and nineteenth century river bed, now exposed by erosion, with tantalising fragments of white pipe protruding. We squatted down to peer at the tiny bowl of a pipe, washed from the mud by the waves that very day and exposed from the mud for the first time. 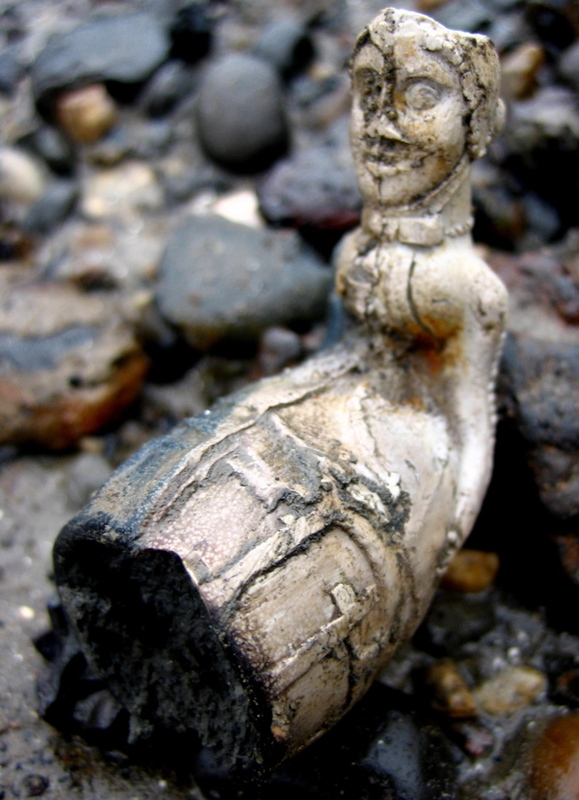 In the shape of a lady with a wide skirt that formed the bowl of the pipe, it was a tiny sculpture with a presence all its own, and we were the first to touch it since whoever dropped it two hundred years ago. Steve’s eyes popped because he never saw one like it before. Moments like this are what keep bringing Steve back, because he knows will always find something, yet he never knows what it will be. We walked miles along the water’s edge in the centre of London and the only others we met were two friends of Steve’s, also searching the shore. I forgot entirely about the city on the river bank above us, because I was down in the river bed in the land of the mudlarks. All of the history of London was present with us, you just had to look, and it was a magical place to be. 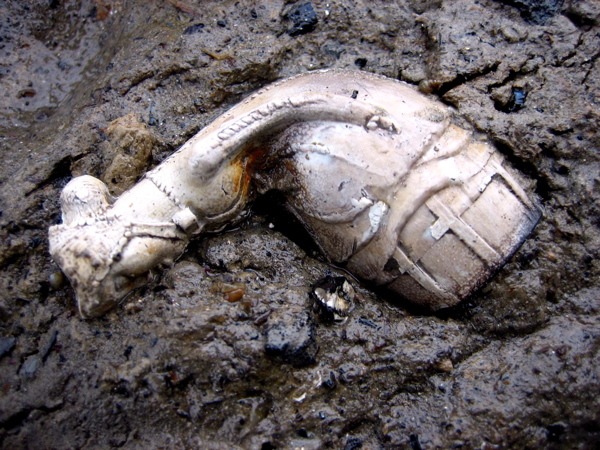 Take a look at www.thamesandfield.com where you can see more than thirteen thousand pictures of Steve Brooker’s incredible finds that have earned him his reputation as the Mud God. The detritus of the former shipyards lines the shore. 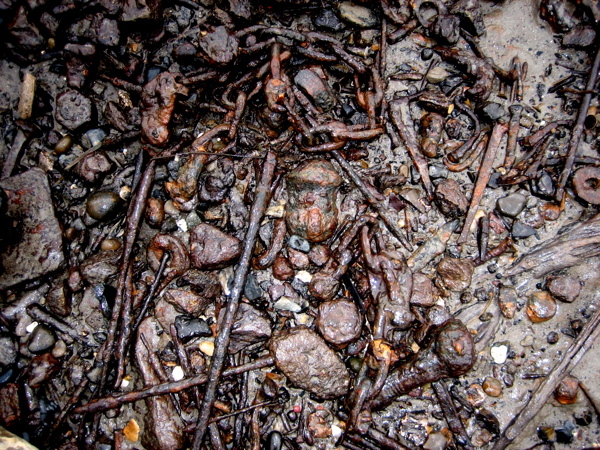 Thousands of bullets lie in the mud at Silvertown. The lady recovered after two hundred years. Our haul, a tudor brick, decimal coins, bullets, marbles, a spur, an eighteenth century fork, a cabinet handle, clay pipes, a shell dated 1942, a fragment of a Bellemine jug, a broken seventeenth century buckle and a horse’s tooth. Steve Brooker, the Mud God. 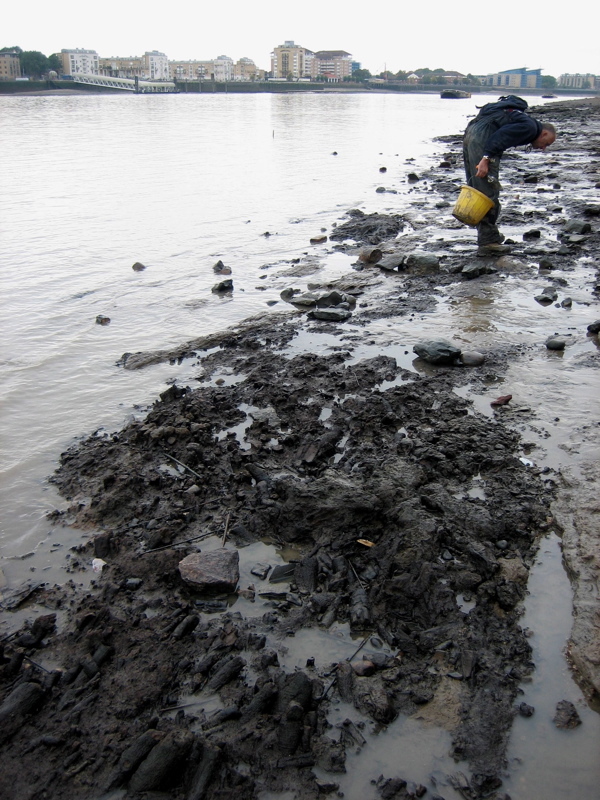 Mudlarking on the Thames, with remnant of a mesolithic forest in the foreground. Fabulous post – I love the thought that there are people like Steve all around us, looking intently at the world, armed with a trowel and years of experience. Thank you. When is the TV programme being aired that features Mud God. Or have I missed it? I love, love, love this post. Steve is one of my London heroes, I would love to do what he does for just one day! Does he do courses or anything? 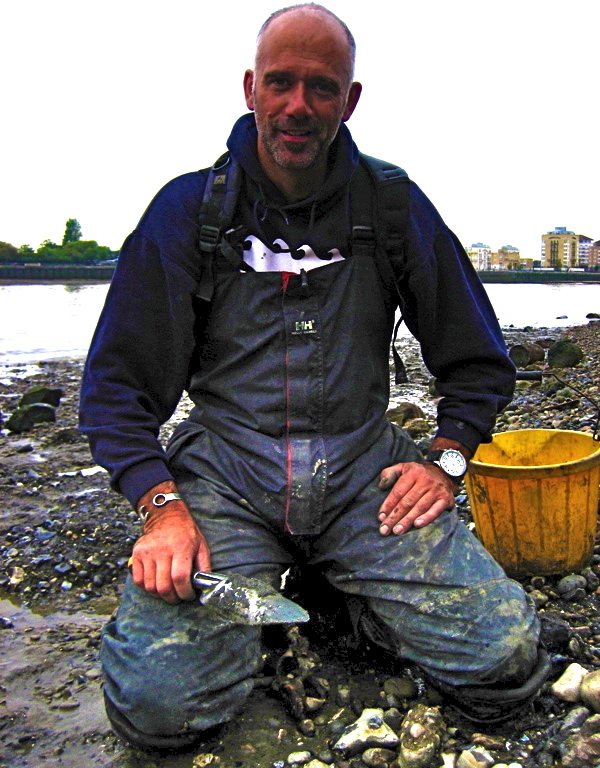 I don’t know if Steve takes groups on mudlarking expeditions – I would love to join one. London Walks periodically does one and it is very informative. I found several clay pipe stems and part of a tudor tile. Hi Steve,I’m a Londoner based in Australia but come back every year to see my 93 yr. old mother.I’ll be with her in a few days.In the 60′s my holiday job was to help my uncle (Jim Page-Roberts)renovating a warehouse on Three Colt St in Limehouse.My job was to dig a 10ft deep hole in the basement for a new septic tank.As I dug deeper the history of the site was revealed.First a shoemaker,then an apothercary & then a clay pipe maker.That was when he told me about Mudlarks. As a photographer,is there any chance I could join you with your fellow Mudlarks to take some pics? I have found a small piece of beige pottery with SSY lettering on it, the rest is missing, its a pale blue glaze on the inside of the piece. It was found in bostal woods from The View in Belvedere kent. Can any1 tell me what this could be or where I can upload a photo to get it checked out, I’d like to know what history is behind it so any info would be greatful.